NETWORK FINALS: THE BIG BANG THEORY gained 0.1 in final numbers, while I FEEL BAD and MOM lost the same. In addition, THURSDAY NIGHT FOOTBALL adjusted to 4.7, up 0.4 from last week. CABLE HIGHLIGHTS: NFL Network’s share of THURSDAY NIGHT FOOTBALL was at 1.09, up 0.05 from last week. On MTV, JERSEY SHORE gained 0.06 to 0.67, and HOW FAR IS TATTOO FAR debuted at 0.34/0.30. Bravo’s SHAHS OF SUNSET, after an odd 0.16 drop last week, was back up two-tenths to 0.31. ESPN’s COLLEGE FOOTBALL game was at 0.31. MSNBC’s RACHEL MADDOW SHOW had the cable news lead for the first time since the Kavanaugh testimony at 0.30/0.39, 2.6M, with Fox News’s THE FIVE at 0.28/0.44/2.8M, and CNN’s CUOMO PRIME TIME at 0.29/0.46/1M. Comedy Central’s THE DAILY SHOW had an unusual #12 ranking at 0.28. On ID, TO CATCH A KILLER rose 0.08 to 0.27, and THE CORONER was up 0.05 to 0.23. Nickelodeon’s LOUD HOUSE was at 0.27. 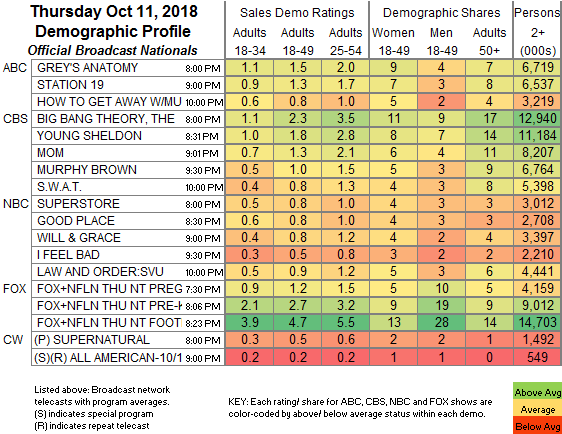 Tru’s IMPRACTICAL JOKERS was at 0.25, compared to last week’s 0.35/0.25. History’s MOUNTAIN MEN was at 0.23 compared to last week’s 0.22/0.17, and was followed by THE RETURN OF SHELBY THE SWAMP MAN at 0.18. Food Network’s BEAT BOBBY FLAY jumped 0.09 to 0.23. 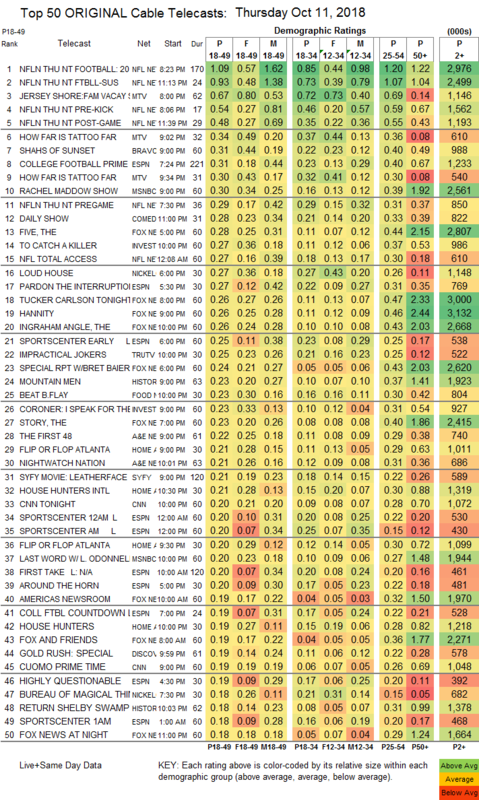 On A&E, THE FIRST 48 was at 0.22/0.16 compared to last week’s 0.27/0.20, and NIGHTWATCH NATION was down 0.03 to 0.21. On HGTV, HOUSE HUNTERS INTL ticked up to 0.21, FLIP OR FLOP dropped 0.06 to 0.20, and HOUSE HUNTERS was down 0.02 to 0.19. A GOLD RUSH special on Discovery was at 0.19. We’s GROWING UP HIP-HOP was at 0.18. CMT’s DALLAS COWBOYS CHEERLEADERS was at 0.10. POP’s IMPACT WRESTLING dropped off the chart, down 0.01 to 0.04/183K.